12 The PCB Magazine • December 2016 by I-Connect007 Research Team We all know that without a concerted sales effort there are no customers, and without cus- tomers there is no business. 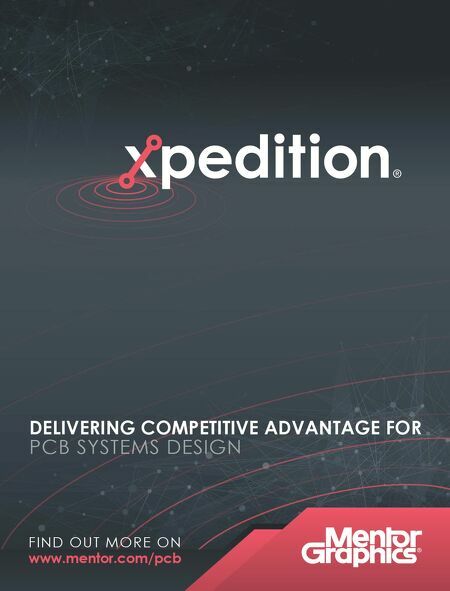 It is also no secret that most companies in the printed circuit board fabrication and assembly businesses have suffered from lack of sales over the years— pos- sibly because company leaders are traditionally technologists, engineers or operations people. And these people have very little, if any inter- est, in the art of sales and marketing. In fact, until recently, most companies did not believe in marketing their companies at all—figuring that if they built great products, customers would show up at their door. But times are changing and companies have been forced to focus more on their sales and market- ing effort as they realize that they must find new customers and win their business if they are going to live another day. 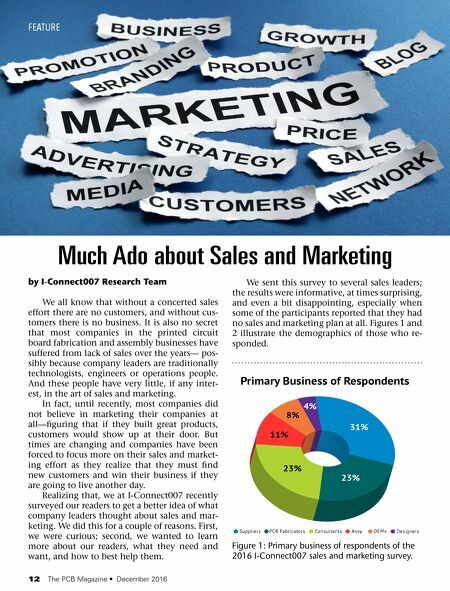 Realizing that, we at I-Connect007 recently surveyed our readers to get a better idea of what company leaders thought about sales and mar- keting. We did this for a couple of reasons. First, we were curious; second, we wanted to learn more about our readers, what they need and want, and how to best help them. We sent this survey to several sales leaders; the results were informative, at times surprising, and even a bit disappointing, especially when some of the participants reported that they had no sales and marketing plan at all. Figures 1 and 2 illustrate the demographics of those who re- sponded. FEATURE Much Ado about Sales and Marketing Primary Business of Respondents Suppliers PCB Fabricators Consultants Assy. OEMs Designers 11% 8% 23% 23% 31% 4% Figure 1: Primary business of respondents of the 2016 I-Connect007 sales and marketing survey.